The researchers constructed copper complexes using ligands with varying amine groups. From left to right: N-methyl, N-isobutyl, N-isopropyl and N-tert-butyl. As copper complexes grow bulkier in structure (increases left to right), their movements slow down. This slowing down motion of the copper complexes increases their photoluminescent property and they emit brighter light. 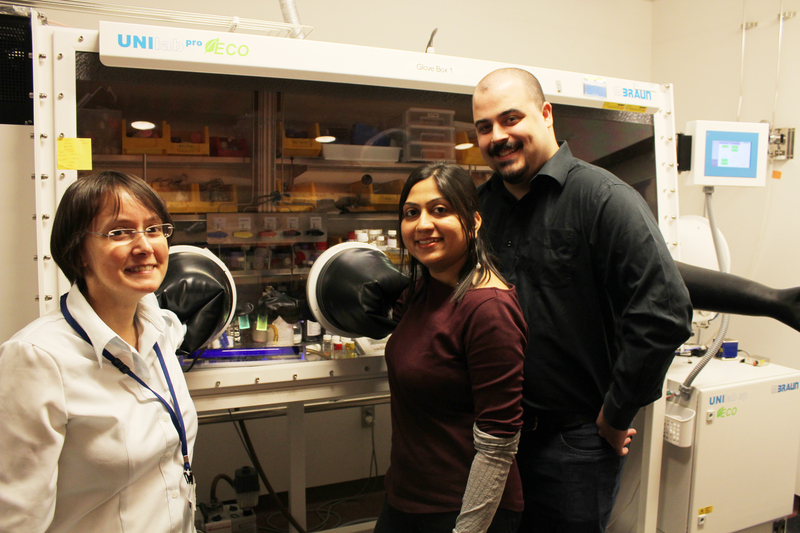 Prof. Julia Khusnutdinova, Dr. Pradnya Patil and Mr. Sébastien Lapointe demonstrate how the ligands are prepared in their laboratory at OIST.